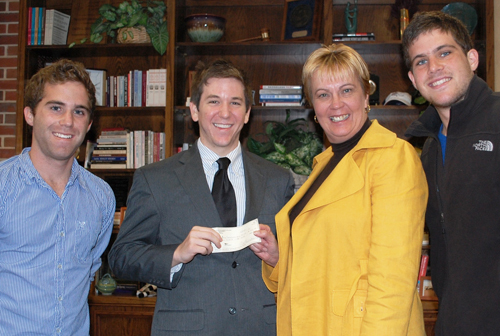 At center, student entrepreneur David Russell presents a $500 check to College of Business Dean Caryn Beck-Dudley. The check was presented as thanks for encouragement and resources provided by the college that enabled Russell and his partners, Tom Brady (left) and Alex Wolniewitz (right), to start up and grow their own business, Moolaguides.com. Moolaguides.com allows students to upload and sell their class notes online. Since they started Moolaguides.com in fall 2010, the innovative trio reports the sale of more than 10,000 study notes at Florida State University, which has earned students who posted their notes a total of nearly $90,000. They also are beginning to branch out to other universities in and out of Florida. The brains behind Moolaguides.com are classmates and partners David Russell of Coral Springs, Fla.; Alex Wolniewitz of Mexico City; and Tom Brady of St. Augustine, Fla. The juniors, all entrepreneurship majors in the College of Business, recently presented Dean Caryn Beck-Dudley with a $500 check as thanks for encouragement and resources from the college that have allowed them to start up and grow. Russell said the basic idea for Moolaguides came to him during his freshman year at Florida State. "I started selling my notes and quickly figured out that the whole selling process was a pain for both me and for the person buying," Russell said. "We would both have to coordinate a location and a time to meet, I would also have to print out all my notes, and I could only accept cash from the buyers. From this, I thought of the idea of a website where students could go and buy or sell their notes instantly from the comfort of their homes." Russell later presented the idea to the other entrepreneurship-program majors in his "Sophomore Experience" class and became partners with Brady and Wolniewitz, who shared his excitement for the concept. The course provided the trio with start-up capital, strong mentors and the inspiration to put their ideas into action. Now, in addition to the three directors/partners, there are three street representatives helping to expand Moolaguides to other universities. Brady, Russell and Wolniewitz's business venture reflects Florida State's mission to transform itself into "the Entrepreneurial University." That mission places a campus-wide emphasis on creating a culture among students, faculty and staff in all academic disciplines that embraces entrepreneurship, creativity and innovation, and that supports the concept that those who take calculated risks can gain enormous benefit. Here's what the Moolaguides.com directors had to say about how they keep their business growing and why they made their contribution to the College of Business. What were some practical things you learned through the entrepreneurship program that have helped your business? This class is mainly hands-on by learning through experience and guidance. Moolaguides.com was one of 13 businesses that started up in the "Sophomore Experience" class, so some of our motivation and ideas on how to improve came from our classmates. Another tool that we had available to us was the junior and senior class in the program, who gave us advice and insight from the experiences they learned with their start-ups. College can be expensive. Between the cost of food, rent and tuition, that means holding a part-time job for a lot of college students. Once you add on a full-time course schedule, extracurricular activities and a social life, a college student's time becomes extremely limited. Our website not only helps students by freeing up their time but also provides an incentive for industrious students to be compensated for their hard work. Moolaguides.com was created for students, by students, to provide another avenue of monthly income for students. Note-takers upload and sell their notes instantly online. They start making money from the study guides (notes) that they would be taking for themselves anyway. At the same time, note buyers can gain 24/7 access to notes online and purchase them with PayPal, debit and credit cards. Students with less-than-perfect attendance or mediocre note-taking skills now are able to gain access to information collected by their peers from class, which will help them in learning the information that they otherwise would not have access to. How has Moolaguides.com been received by students? Most students that we talk to are excited about the idea. During the spring 2011 semester, we received more than 120,000 views and sold 3,800-plus study guides We now have recorded a total of 300,000 views and have sold more than 6,000 study guides. Students are averaging over $100 for sale of their class notes. Since we started, we've had sales of more than 10,000 total study guides at Florida State University alone, and students have earned a total of more than $70,000 for their notes. How do you judge the quality of notes? Whenever anyone posts notes on the site, we ask them to take a screenshot of their study guide. This way, their classmates and any other student wanting to purchase them can see what type of content they can expect. We also have a profile system and ratings. When users hit certain landmarks, such as posting five study guides, or an individual guide selling 10 copies, the individual receives a ribbon and a trophy icon, respectively. This shows purchasers that the seller has not had any negative issues in the past. Also, if someone buys notes that they are not completely satisfied with, we strongly encourage them to give feedback through our rating system. The note takers on our site are also obligated to respond to refunding issues if the situation arises. How does the company make money from this endeavor? Has Moolaguides.com made a profit? Moolaguides.com allows our note takers to name their own price (which is usually around $10), and we receive a 20 percent commission from each sale/transaction. Most of our competitors will take the students' notes and sell them for however much (the company) wants, and only give their note takers as little as 50 cents per sale. Moolaguides has been profitable for us so far; however, we are always looking for new projects and ways to reinvest in the company. What is the responsibility of the street representatives? Part of why Moolaguides was able to take off so quickly at FSU was because every time someone advertises a study guide, they are contacting all of their classmates, who now also see the opportunities our site provides for them. Our street representatives are students at college campuses across the country, and their job is to create a spark at a new university by handing out fliers, "chalking" their campuses, creating social media hype, and telling their friends to develop a solid study-guide contribution base from their universities. We are hoping other campuses are similar to FSU in that just a couple of study guides lead to a snowball effect, with more and more study guides being uploaded and sold. How many universities are involved? Which do you get the most business from? We currently generate most of our sales from Florida State but have active users from Tallahassee Community College, the University of Central Florida, Florida Atlantic, the University of Florida and Florida A&M. In addition, we have been working with promotion companies that have roots down in South and Central Florida to saturate those markets, and we have several schools in the eastern United States, ranging from the University of Maryland to New York University. We predict that by the end of the spring 2012 semester, we will have expanded to most of the Florida schools as well as a handful of out-of-state campuses. We plan on growing the business to be as large as we think we can handle. It's hard to say what will happen after that. Our current growth strategy includes using connections from friends at new universities to help flyer, chalk and talk about Moolaguides with everyone they can. We also contribute information to blogging websites as a way to generate interest of their users by urging them to give our service a shot. We're also working with certain companies that help promote our product at various universities throughout the nation. In addition, we're looking into social media marketing campaigns, and we will soon be introducing a Moolaguides.com street team, will be able to make a collegiate tour and hand-out free stuff and spread the word about this new cool way for college students to make money. What prompted you to present a check to College of Business Dean Beck-Dudley? There are several reasons we decided to donate money to the College of Business' Y.E.S. Foundation. Y.E.S. is the Young Entrepreneurship Society, which is a club based around the 40 students in the entrepreneurship major. The club usually host events promoting the companies within the program and sometimes brings in young entrepreneurial guest speakers to talk to the class. First and foremost, the entrepreneurship major and the "Sophomore Experience" class gave us the resources and motivation to initially start up the company, and for this we are forever grateful. Second, being a product of the "Sophomore Experience" class, we know the money will be going toward creating more value by helping finance the next class's businesses and hopefully aiding and motivating additional students to become even more successful than us. In the future, I would like to see more students who find success from this program also give back if they can. The more resources we have available to our successors equates to more talented students entering the program, as well as more connections that will become available to both us and the College of Business. For more information on Moolaguides, contact Barbara Ash of the FSU College of Business at (850) 728-7014 or bash@cob.fsu.edu, or student David Russell at dmr08e@my.fsu.edu.